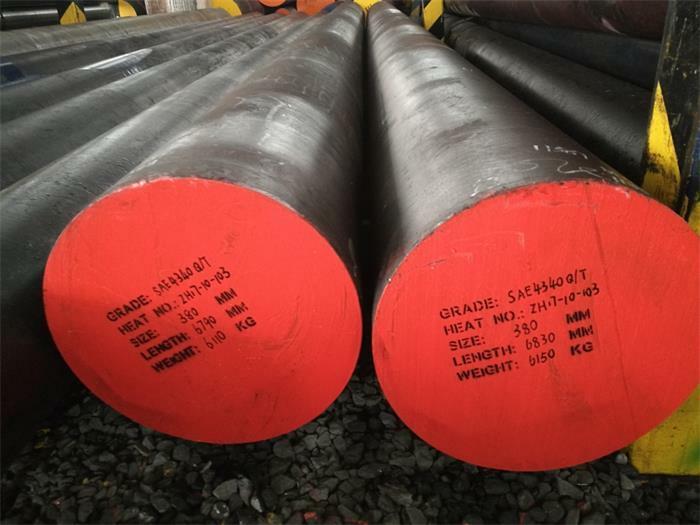 AISI 4340 steel Manufacturer and Exporter,supplied with round,square,flat,block,and shaft etc.AISI 4340 is defined as a heat treatable and low alloy steel which has 0.8% Cr, 0.2% Mo and 1.8% Ni as strengthening alloy elements.Compared with AISI 4140,it has higher strength and toughness,also it has very good fatigue resistance, wear resistance and atmospheric corrosion resistance.AISI 4340 is generally supplied in hardened and tempered condition with the tensile range of 930 – 1080 Mpa ,hardness 280-320HB.Pre hardened and tempered 4340 can be further surface hardened by flame or induction hardening and by nitriding. Forging temperature should be carried out between 1150℃-1200℃,The lower the forging-ending temperature ,the finer the grain size .hold suitable time for the steel to be thoroughly heated before forge, but don’t forge below minimum forging temperature 850°C. AISI 4340 has good forging characteristics,but crack is easily occured when improper cooling way after forged,so it should be cooled as slowly as possible in still air or in sand after forged. Normalizing is used to refine the structure of forgings that might have cooled non-uniformly after forged,and considered as a conditioning treatment before final heat treatment.Normalizing temperature for AISI 4340 steel should be carried out between 850℃-880℃. hold suitable time for the steel to be thoroughly heated to complete the ferrite to austenite transformation.Cool in still air. Full annealing is recommended for AISI 4340 before machining, AISI 4340 should be carried our at a nominal temperature of 830℃-850℃,hold suitable time for the steel to be thoroughly heated, then furnace cooling to 610℃ at a rate of 11℃ per hour, finally air cooling. This heat treatment will obtain martensite structure after quenched.It will increase the surface hardness and strength.AISI 4340 should be carried out between 830℃-865℃, hold suitable time for the steel to be thoroughly heated, soak for 10-15 minutes per 25 mm section, oil quench is recommended.Tempering should be followed immediately after quenched. AISI 4340 alloy steel should be in the heat treated or normalized and heat treated condition before tempering.Tempering is usually carried out to relieve stresses from the hardening process, but primarily to obtain the required hardness and mechanical properties. The actual tempering temperature will be chosen to meet the required properties.it is usually carried out at 450℃- 660℃,hold until temperature is uniform throughout the section, soak for 1 hour per 25 mm of section, and cool in still air.Tempering between 250℃-450℃ is not avoided as tempering within this range will seriously reduce the impact value,result in temper brittleness. AISI 4340 is often used in preference to AISI 4140 at the higher strength levels because of its better hardenability and improved CVN impact toughness. Typical applications include:Heavy-duty axles, shafts, heavy-duty gears,spindles, pins, studs, collets, bolts, couplings,sprockets, pinions, torsion bars, connecting rods,crow bars, conveyor parts,forged hydraulic,forged steel crankshafts etc.